Even though global climate change is evident across the world, it is just as noticeable in our own communities. I appreciate Earth Day 2013, Faces of Climate Change, because, as a Floridian, I have observed climate changes in the Tampa Bay Area recently. The temperatures drastically fluctuated in a two month period when Tampa faced record lows and highs. We faced extremely cold temperatures in March, yet set record highs in mid-April. Just because I notice the changes in my community doesn’t mean that everyone does. It’s sad to say, but, there are people who do nothing but contribute to the damage our generation is inflicting on our planet. It’s selfish that these people aren’t open to altering their lifestyles to improve and preserve the state of the environment. 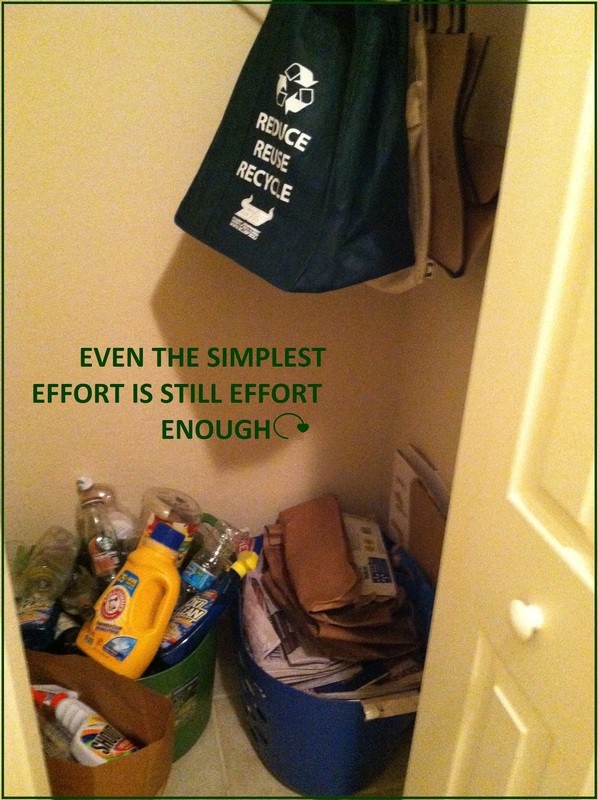 There are small steps that to take to live a more sustainable life, which are easily available. Not matter the size, the effort will make a difference. I took a quiz on Earth Day’s website because I was curious about the lifestyle I have grown accustomed to. Although I recycle my papers and plastics, my ecological footprint proved to be embarrassingly high. The quiz suggested I be more conscious about the amount and type of packaging products purchase. It also stated that consuming local products as opposed to meats or processed food is an easy step towards reducing your ecological footprint. I want to be one of the faces of climate change and with a little effort I know I can make differences, for my life and others. When you think about it, culture influences society and “going green” is arguably a cultural movement influencing today’s society. Environmentalism and sustainability are ideas that are gaining attention from citizens, policy makers, companies and even advertisers. It’s not a new concept in terms of environmentalists, or in general—people have been concerned about the environment for many, many years—but, companies and advertisers have recently tried to make the public aware of their sustainable motives, no matter the size. Perhaps companies and advertisers think promoting sustainability will have a successful outcome for their product or service because that is what the public cares about. And in a sense, I think people want to act like they care about it, but in reality…they only kind of do. This is why I say that the whole “going green” concept is influencing society because people and companies want to act as if they are doing their best to not harm the environment. I mean, I definitely fall into that category—I try to recycle, I understand what sort of things harm the environment, but am I really doing all I can to be environmentally friendly and reduce my carbon footprint? Probably not, and neither are the companies that say they’re environmentally friendly. I guess what I’m trying to say is that going green has become a common phrase in our society today, many people are promoting it, but are people really going green? Or are they just thinking green? Just some things to ponder when considering how culture shapes society. This state of the current economy has actually boosted the public relations industry in this otherwise downward economy. It is public knowledge that big business was involved in sketchy situations and some were even tainted with corrupt officials who provoked and angered society. Therefore, businesses now, more than ever, rely on public relations firms to please the public by communicating to citizens about company actions and status so they understand the processes. According to one private-equity firm, Veronis Suhler Stevenson (VSS), public relations has seen an increase in spending by about 4 percent in 2008 and 3 percent in 2009, while forms of marketing like advertising actually experienced a decline in spending by 3 percent in 2008 and 8 percent in 2009. This could be expected since PR mainly focuses on free media, rather than spending for exposure such as advertising does. Recently, with the boom of social networking sites such as Facebook, the PR industry has shifted towards using these social media and networking sites as another tactic for free coverage. PR firms that can effectively take advantage of this new exposure will have the most success in the long run. Social media is an important tool the PR industry needs to capitalize on. Networking is building and maintaining relationships and is key element for the success businesses PR. Social networking has an even greater advantage. It has the potential to be even more engaging when it comes to benefiting business because social networking involves a constant interaction among companies and their consumers or clients. Where PR firms used to be mainly concerned with one way communication by promoting and establishing a favorable relationship with the public, PR firms can now participate in a two way communication between themselves and the public, through social media sites, to enhance their reputation. Businesses can use social media as an effective PR strategy to enhance their reputation because consumers can interact with businesses on a day to day basis, whenever it is convenient for them. Social media offers businesses with the opportunity to receive direct feedback and even influences from those who use their products or services, making the communication process even more existent than it used to be. Can PR Help the Commercial Nuclear Power Industry? It is sad to say that not all renewable energy sources are 100% sustainable at all times. This is evident because of the recent downfall of Fukushima Daiichi nuclear power plant’s reactors in Japan. Nuclear energy has long been debated and public relations specialists representing nuclear power plants, especially in Japan, have serious issues they need to relay to the public if nuclear power plants want to stay in operation. Unfortunately, incompetent public relations are often associated with the commercial nuclear power industry internationally, along with economic and technological calamities, argumentative political positions, environmental threats and regulatory pressures. Back in the 1980s nuclear energy was thought to be a promising way to generate unlimited and cheap electricity. However nuclear energy is accompanied by a series of hazards that far exceed the benefits according to a medical doctor, Helen Caldicott. The ever debatable issue of nuclear energy may have finally met its match with the current problem occurring halfway around the world and the PR industry may not be able to save it this time around. Yet, with proper communication skills the nuclear energy industry may be able to survive. In today’s society, energy production is an important aspect of our society, as is how we attain it. In a world that is fixated on how things are perceived, it would seem rational for companies of the United States, as well as companies from other countries around the world, to replace the traditional generation of energy from nonrenewable energy sources to renewable energy sources not only for the sake of our life and that of future generations, but also to maintain good public relations. The majority of energy generated in the U.S. is derived from fossil fuels, such as coal and gas. However, the extraction process of these resources impacts the environment and has several negative consequences. People from different regions of our nation are not satisfied with how companies operate in terms of environmental degradation. Filing law suits against companies for damage to one’s property or community does occur and ultimately taints companies’ persona. Therefore, if companies of our country make the change from fossil fuels to alternative energy to save the environment from degrading, it would seem expected that such companies would maintain an esteemed public image. The extraction of oil is also known for its negative impacts on the environment. For instance, BP was responsible for a tragic incident that involved oil spilling in the Gulf of Mexico last year and it is still suffering from spilling a dangerous, nonrenewable resource. In addition to oil spills, oil produces byproducts of wastewater and sludge that can be dangerous to wildlife, as well as harm humans, not to mention the carbon dioxide that is emitted from automobiles. Companies that face environmental issues such as this one have irreparable damage to their name and it is not uncommon for such companies to struggle to overcome their tainted reputation. However if energy production was created by a different means, such as renewable energy sources, it would be fairly easier to maintain a respectable public image because energy would still be created, yet it would not be polluting the planet for the future. Natural gas drilling is a relatively new way for extracting gas from below earth’s surface, however it has been found to have negative environmental consequences, also. Not only does drilling cause drinking water to be contaminated, but also natural gas drilling can cause smog. Smog is a contributor to ozone which is another greenhouse that causes climate change, and places like Wyoming were recently experiencing dangerously high levels of smog statewide. On the other hand, alternative energy has positive effects, including the fact that it has the potential to create hundreds of thousands of jobs, which could be an aspect of good public relations in an economy such as the present one. Even President Obama vowed to take steps towards using renewable sources for alternative energy in the U.S. As the U.S. adapts to different sources of energy generation, other developing countries may be urged to follow in our footsteps toward a healthier planter. These types of energy generation are clean, environmentally friendly, sustainable and dependable, in addition to some being cost effective. Naturally it would appear that companies that create alternative energy would be able to preserve a well-thought-of public image due to their sustainability and care for the planet. The negative consequences caused by extracting fossil fuels and natural gas are responsible for many companies that do the extracting to be held up in court and tied to the legal system simply because groups oppose the harm they are causing to the environment. If energy companies would consider alternative energy production they would be more accepted from the community while constantly maintaining reputable public relations. St. Petersburg, Fla. is a vacation spot that offers various types of attractions for all ages. Annually, tourists from all over America, as well as from around the world, travel to St, Petersburg to relax and enjoy the scenery. Beautiful white sandy beaches that appeal to tourists looking to soak up the sun. Among such is Ft. Desoto Beach, which has been previously rated as America’s number one beach. In addition to visiting beaches, tourists can visit a wide variety of galleries, such as the Salvador Dali and Holocaust museums. If that is not appealing, surely something in the St. Petersburg area is, whether it is a Ray’s baseball game at Tropicana Field or a quiet stroll along the Pie. Tourists can always keep themselves entertained in St. Petersburg. Yet, the city of St. Petersburg has recently experienced rare circumstances that may eventually threaten to damage the warm and peaceful image of the city. While crime in the city has gone down over the last few years, the St. Petersburg Police Department has suffered a few casualties in the last two months. Since that time the police department has lost three officers in the line of duty, which has not happened in the St. Petersburg district for nearly 30 years. Unfortunately, after the cop killings occurred, some forms of media have portrayed the city in somewhat of a negative limelight. While there are some articles suggest that not all hope is lost for the St. Petersburg community, some people should be concerned about a new presence in the city. As of now, tourism for the St. Petersburg area appears not to be threatened. However, if the Uhuru Movement brings itself to mainstream media and condone further cop killings in the area, as a way the African people seek to resist being oppressed by the police force, then St. Petersburg may have to deal with a large problem of negative PR. The NFL’s potential lockout threatens to affect football players as much as football fans and the media itself, all the while owners stand with the most to gain. Football can easily be labeled as the most popular professional sport in America. Super Bowl XLV, played in Arlington, Texas, was the most watched Super Bowl in history. On that note, Super Bowl XLV was the most watched television program in the history of American television, with an average of 111 million viewers and 163 total viewers. Reminiscing about Super Bowl XLV is disturbing on two scales. To begin, remembering the Pittsburgh Steelers offense turnover the ball to the hands of the Green Bay Packers defense remains painful. On the other note, the Pittsburgh Steelers losing Super Bowl XLV isn’t the biggest concern in the scope of the future football, because there may not even be football next season. The National Football League’s collective bargaining agreement is an agreement between the NLF and the National Football League Players Association which is currently scheduled to expire on March 3, 2011. This agreement consists of expectations between the players and the owners of various football franchises. However, with owners and the NFL demanding outrageous cutbacks for players, the game we know and love threatens not to return next season due to a potential lockout. Essentially, a lockout is when an employer forces employees not to work. In the case of the NFL, a lockout prevents football players from playing football next season, while owners still receive pay. The lockout is solely for the purpose of allowing owners to have a pull over their players. It’s aggravating to witness owners of beloved football franchises withdraw from the CBA for the purpose of generating more money. Owners are already billionaires, so a lockout seems corrupt since it would be against millionaire players. Keep in mind that NFL players are the lowest paid professionals in American sports even though football is extremely physical, and career’s for professional football players are far shorter than other professional sports careers. Regardless if there is a football season next year, owners will continue to receive pay through the lockout. This ultimately means that football players as well as the media and fans alike will reap the consequences of a season without football due to negotiations not being met between the NFL and NFLPA. Football players are not the only people who stand with a considerable amount to lose from a possible lockout. Media personnel, including television broadcasting and advertising as well as companies that cooperate with the NFL, such as: NBC or FOX could see dramatic decreases in their revenue if a lockout occurred. Since the NFL relies heavily on advertising agencies to produce revenue, such agencies could see a loss in numbers as a result of the NFL not continuing next season. From a journalism perspective, newspapers could lose readers and business. Almost every newspaper has a sports section dedicated to America’s most popular sport, football. Select readers buy newspapers solely for skimming the sports page, and football is a huge portion of the sports page. If a lockout went into effect next season, newspaper companies, especially the sports page could be significantly impacted. In terms of a PR stance, a lockout could be detrimental to teams in the future. The NFL could experience the same setbacks as MLB, after the MLB lockout ticket sales were not as high as pre-lockout sales due to how fans interpreted the lockout. In the long run, a NFL lockout could considerably impact: football players, the media, fans and owners as well. A regular season extension would be rough on players due to the physicality of the sport. Many players develop severe injures by playing just 16 games. Also, a salary cap seems unreasonable considering that players would have to play longer and receive less pay. In addition to playing more and getting paid less, health benefits would be cut. This could be considered most offensive because football players are highly susceptible to accumulating health problems due to injuries from playing football.